Ahern explains why he chose McAleese over Reynolds: I didn’t actually know Mary McAleese personally. I didn’t know [her] at all.But when we were running her name as an unknown she was actually pulling support from outside Fianna Fáil. BERTIE AHERN BELIEVES he could have been a contender in this year’s presidential election if Fianna Fáil’s popularity had not “gone south”. In an interview with Dublin City University’s radio station, DCUfm, Ahern said the party’s popularity – or lack thereof – “snookered” any possible bid. “Well I think if the party popularity didn’t go south, I mean I still would have done alright,” he said. I think it would have been [the perfect job for me] in the normal case of events. If there was no downturn and if it wasn’t [for] all the hassle of the tribunals and everything else, then you could have a good run at it. He said the party had already crunched the numbers, placing his support at about 30 per cent and the party’s at just 20 per cent. “If it was the other way around, if you were on 30 per cent and the party was on 40 per cent, you would hope the party would pull you in but there’s no hope that I could win,” added the former Fianna Fáil leader. The former Taoiseach said he believes Fine Gael’s candidate Gay Mitchell will top the polls. 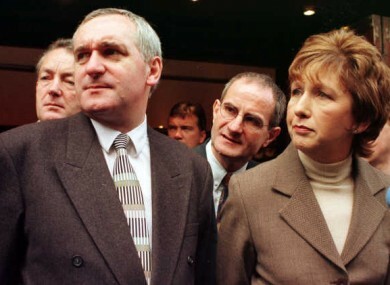 Commenting on McAleese’s nomination by Fianna Fáil in 1997, Ahern said he did not “shaft” Albert Reynolds, who was hoping to gain the party’s support. I had no problem with Albert Reynolds running for the presidency but the harsh reality was that our poll figures were showing that he wouldn’t make it. Drawing a parallel, Ahern said that he was not in this year’s race for the same reason. “I would not get elected,” he told the student radio station in an interview due to be broadcast in late September. The interview was carried out in last month as part of a student research project in which Linehan will interview the country’s living taoisigh. Email “I would have run for President and 'done alright' - Bertie Ahern”. Feedback on “I would have run for President and 'done alright' - Bertie Ahern”.